The Tibooburra LALC functions under the New South Wales Aboriginal Land Rights Act 1983 and is an autonomous body working in conjunction with the New South Wales Land Council. History and information on NSWALC can be found at www.alc.org.au. 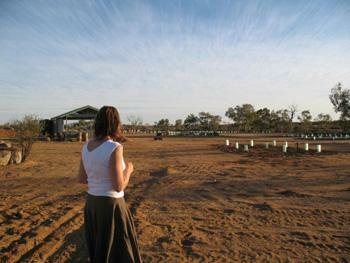 Local Aboriginal Land Councils are funded under an agreement with NSWALC by NSWALC. No Land Councils in NSW are government funded. One of the functions of Local Aboriginal land Councils is the protection and promotion of culture and heritage. Telling Stories to local school children during NAIDOC week. The Tibooburra Local Aboriginal Land Council proudly holds their 'Keeping Place' museum open to the public. 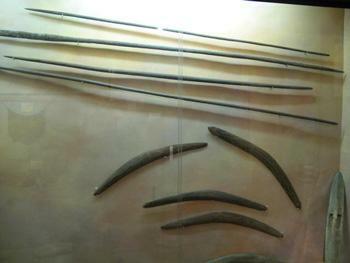 Much of the display is in partnership with the Australian Museum, Sydney. Above is a portion of our display. Visitors are welcome at the Tibooburra LALC office to wander in the native garden, browse the library, or purchase a book or souvenir. A wander through the Keeping Place will allow the visitor a glimpse into the nomadic life of the Wangkumarra, Malyangapa and Wadigali tribes who moved through what is now known as the 'Corner Country'. Visitors are welcome to camp at the non-powered sites on the Aboriginal reserve, apportion of land granted to the Tibooburra Local Aboriginal Land Council. 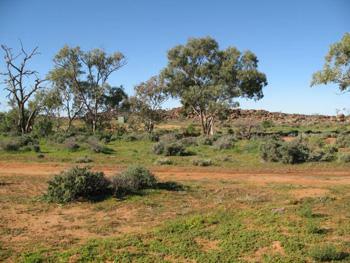 This portion of land holds much history for local aboriginal people. It is the area where the aboriginal people of the township had their fringe dwelling camps during the late 19th and up to mid to late 20th centuries. 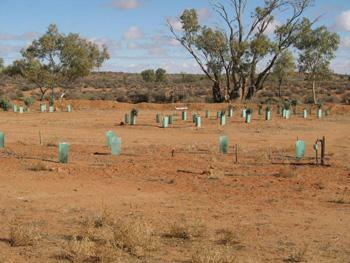 Currently the Tibooburra LALC is improving this land with revegetation. The revegetation will provide defence against wind erosion, more natural shelter for campers and in the future a supply of firewood and indigenous medicinal plants from local species of shrubs and trees. There has been placed a natural barrier of boulders to prevent visitors unknowingly driving over heritage camp sites. Above is a view of the main camp sites. There are others across the other side of the creek. The Tibooburra LALC has successfully applied for NSW Government Environmental Trust grant of $20000 over 3 years, currently into its 3rd year, for the project "Increase Awareness of Aboriginal Heritage and Culture". Lodged 2 progress reports with the Trust. record oral history of the Reserve with local Elders. The Tibooburra Local Aboriginal Land Council invites you to camp at their Reserve while visiting in Tibooburra and enjoy the fresh, openness of the area. At the moment, there are many new plantings which we know visitors will respect and will probably revisit to view the changes. Currently fees are $5 per night per vehicle, payable at the TLALC office. Pets and campfires are welcome (wood must be brought in). Office phone: 08 80913435. 9am to 1pm. There is plenty of space provided as camp sites between the plantings as shown above.